Forecasting with Friends - Thoughts From The Frontline - Investment Strategies, Analysis & Intelligence for Seasoned Investors. Economic and market forecasting are similarly pointless fun if you don’t try to turn your forecast into next year’s trade list. Just as no war plan survives contact with the enemy, no investment plan survives contact with February. The real value of an annual forecast is strategic. It helps you set priorities, define important issues, and think about what you should anticipate and what you can safely ignore. That’s a good exercise to go through periodically, and January is as good a time as any. I gave you my own thoughts last week (see “Skeptically Optimistic”). Today we’ll review several other forecasts from people who deserve your attention. Of necessity, I must leave out some good ones, but I think the ones I cover will give you plenty of useful information. As I noted last week, this particular upcoming year is unusual due to unfolding political events. The next three months or so will tell us a lot more about how US fiscal and monetary policy will change. The last eight months of 2017 are highly dependent on what happens in the first four. We could easily be in a whole different environment by May, and it could be a better one, or it could be worse. In that regard, my Strategic Investment Conference is perfectly timed for May 22–25 in Orlando. By then we will know much more about changes in US tax policy, stimulus spending, and Federal Reserve and Supreme Court appointments. We’ll have more visibility on Italy’s bank problems, and we’ll know who won the French election. SIC will be our chance to review and update what we’re thinking. I hope you’ll join me and my all-star guests. It’s going to be a fantastic event. Click here to learn more. And now let’s plunge into the new year with Gavekal, David Rosenberg, Christopher Wood, and Bank Credit Analyst. The Gavekal team, led by co-founders Charles Gave, Louis-Vincent Gave, and Anatole Kaletsky, have a knack for asking the right questions. Sometimes that’s half the battle. Having asked the right questions, they frequently disagree on the answers. But unlike many research firms, they aren’t afraid to reveal their differences. The resulting conversations are inevitably fascinating and informative. This month Gavekal published “Our Top 12 Questions for 2017.” I’ll give you the full list first, then we’ll zero in on their most important answers. Will the US dollar continue its strong rally? Will US bond yields move permanently above 3%? Will the eurozone succumb to an existential crisis? Will capital outflows trigger financial panic in China? Will the oil price end 2017 above US $55? US: Will tax reform push up the dollar or improve the US trade balance? US: Will bonds outperform equities? China: Are A-shares poised for a rally? Europe: Will Britain face recession and sterling fall more? Europe: Will EU equities finally outperform? Emerging markets: Will a dollar squeeze cause financial crisis? Emerging markets: Will Indian growth recover from demonetization? These are all excellent questions. I think the USD was a good way to start the list, too. So many other things hinge on what happens to the dollar this year. Charles and Anatole both think the dollar rally will continue, though Anatole thinks it will not strengthen against the euro. Louis – who will speak at SIC, by the way – has a more nuanced opinion, which I’ll quote in full. If no, then the dollar falls back, US equities underperform and emerging market debt outperforms big-time. • Is it at the expense of ROIC outside the US (i.e. protectionism)? If so, then the concern is that we are seeing a rearrangement of the post-World War II world order. In this case, the US will no longer be willing to provide excess liquidity when needed through a widening current account deficit. Investors should start worrying about a global depression, and consider buying long-dated treasuries pretty soon. • Is it through tax cuts and deregulation? If so, then real rates should rise, and the whole world will grow faster. In this environment, sell all assets that have done well from financial engineering, scarcity assets (gold, art collectibles), and private equity; and buy cyclicals and financials everywhere. I agree with this logic, and I think the full answer is still pending. In my view, people are focusing too much on President-elect Trump’s rhetoric and not enough on his actions. Yes, he intends to demand better trade terms from other countries, but I think his threats are mostly a negotiating tactic. He has placed fellow deal-maker Wilbur Ross in charge of trade negotiations because he wants to make deals. They will favor the US more than current arrangements do. However, Trump and Ross don’t expect to get everything they demand. They will make deals that promote US employment without rearranging the postwar order, as Louis calls it. Tax cuts and deregulation are a bigger question mark, mainly because they must go through Congress. We are already seeing substantial division on the Republican side on other issues. The sausage making could easily end somewhere far short of what markets currently expect. We will get an update from Louis in May. The furious post-election stock rally/bond crash leveled out in late December but has not yet reversed. Conventional wisdom for much of the financial industry is that tax cuts, deregulation, and fiscal stimulus will change everything this year, particularly for banks and energy companies. Proponents of this view think the US economy has plenty of pent-up demand and is ready to grow – enough so that we may actually see a little inflation for a change. My out-of-the-box call for 2017: Trump accidentally engineers a return to the disinflation trade. Rosie doesn’t think inflation is coming back or that the economy is ready to soar, notwithstanding the new management in Washington. He thinks the widespread optimism among investors and business owners is no reason to change your plans. The markets are indeed forward-looking, but this latest leg of the risk rally has a certain speculative feel to it. Now, some full disclosure. I actually find it senseless to provide a forecast for the entire year ahead at this time. We are not in normal, more stable time periods. We have been in a heightened state of volatility, and that will intensify in 2017 because of the political dynamics in the U.S. as well as in Europe. We have a president who tweets the first thing that comes to his head, has appointed a cabinet filled with billionaires even though it was rural blue-collar voters that pushed him over the top, and every pro-growth promise was met with an anti-growth measure. We go into the New Year with investor optimism and equity market valuations running at extremely high levels, so initially the risk is that disappointment sets in, but that may not happen until we are well into 2017. I will go on record to say that sentiment and market positioning are so radically negative on Treasuries that it wouldn’t take much to elicit a countertrend bond market rally. We are way oversold here. The economy isn’t that strong, and anyone who thinks one man can reverse, on his own, the structural forces that led to the multi-year disinflation trend — and I’m talking about excessive debt, globalization, aging demographics, and technology — needs to go back to economics school right away. I think it is very dangerous to be basing investment decisions on expectations of government policy. What is done and when it is done is far too uncertain, and uncertainty is inherently difficult to price. I have to agree with some of this. Rosenberg is right that the structural forces favoring disinflation/deflation haven’t changed. A different trade policy is not going to restore all the jobs our Rust Belt states lost. Eighty percent of the jobs that have disappeared in the Rust Belt were were lost to technological shifts, not to offshoring. Please note the difference between offshoring and completely new manufacturing businesses being set up in China. The jobs were never here; They first appeared in China (or pick a country). The irony is that Apple may indeed start making iPhone 8s or 9s in the US at some point in the not-too-distant future, but they will do so on robotic assembly lines and with nowhere near the number of jobs created at Foxconn for the first iPhones made in China. In fact, Foxconn is now installing robots because they are cheaper than Chinese labor. Can you see a trend here? Demographics are what they are, too. We Baby Boomers will keep getting older, some of us retiring but others, by choice or not, staying in the labor force and not giving younger workers a chance to take our places. Meanwhile China and Japan will face steadily worsening labor shortages. Chinese businesses are trying to move up the economic food chain, away from the dependence on cheap labor. That trend will further advance automation technology, which will then find its way to the US. I think we will get tax cuts, but they may or may not stimulate growth. Details are critical. And plenty of other priorities could get in the way of deregulation efforts. I wish I could prove Rosie wrong, but that’s a feat I have rarely accomplished in many years of trying. He’ll be at SIC, too, so we’ll see what he thinks in May. Chris Wood of CLSA has a marvelous newsletter called, aptly, Greed & Fear. He makes the words even more chilling by artfully casing them as GREED & fear. They become his persona as he writes. He began his January 5 issue talking about bond yields possibly bottoming out. For perspective, he starts with this long-term view of the 10-year US Treasury yield. An inflection point may have been reached in world financial markets, or at least such is what market participants began to think in the final weeks of 2016. 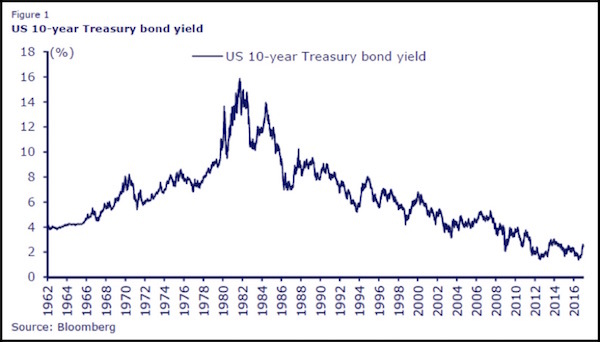 The inflection point referred to is the postulated end to the 35-year-old bull market in Treasury bonds, and the related decline in interest rates that went with it. Remember that the 10-year Treasury bond yield peaked at 15.84% in 1981 and hit a low of 1.36% in July of last year (see Figure 1). Such a view… also assumes the end of lower for longer, clearly assumes that deflationary pressures have also peaked and that inflationary pressures are set to return. It also assumes that there will be no return to unconventional monetary policies in America even as these policies continue for now in Japan and the Eurozone…. Now it is true that there have been countless wrong predictions made before of the end of the bull market in Treasury bonds. Indeed, in every year since the post-financial-crisis recovery began in 2009, the vast majority of economists and strategists have wrongly predicted higher bond yields in the year ahead, only to be forced to change that view later. It is of course this perceived inflection point in policy, and the related hopes for the return of animal spirits to the American economy, which has been the key trigger for the dramatic sell-off in the American bond market and almost equally dramatic rally in the US dollar since Donald Trump’s victory. But from a Federal Reserve perspective these market moves have already served to tighten financial conditions significantly. Meanwhile, the current establishment consensus, most particularly in Washington, is that monetary policy is increasingly impotent and that the “heavy lifting” should now be done by fiscal policy. This explains why just about the only issue which Donald Trump and Hillary Clinton agreed on during last year’s presidential campaign was infrastructure stimulus. Still, if this is the context, it must also be admitted that Trump’s fiscal easing plans are much more aggressive than what most neo-Keynesian establishment policymakers would be comfortable with, most particularly his proposed aggressive tax cuts. While GREED & fear will be the first to admit that tax cuts and deregulation are clearly positive triggers for animal spirits and growth, extreme skepticism is warranted on the hopes currently being invested in the powers of fiscal easing and related infrastructure spending even if it is assumed that a Republican-controlled Congress, containing many fiscal conservatives, is really willing to sign up to The Donald’s spending plans. Meanwhile, the much-discussed protectionist threat represented by the President-elect remains harder to call. GREED & fear’s view is that the most-substantive proposal out there is the draft legislation currently before the House of Representatives discussed here in some detail last month. While not proposing outright tariffs, this draft legislation, which some are calling a “border tax,” has in some respects the same practical effect, as it would remove the tax deductibility against corporate tax of imports, while profits would no longer be taxed at the US rate for exports. Thus, the proposal would tax US imports at the corporate income tax rate, while exempting income earned from exports from any US taxation. There is apparently huge lobbying currently going on against this legislation by corporate America, which is not surprising given annual imports in America are US $2.7tn (see Figure 11) and given the money that has been invested by American companies in their supply chains in the era of globalisation, be it in Mexico, Asia or elsewhere. Still this week’s news of Ford abandoning plans for a US $1.6bn Mexican plant in favour of Michigan is a sign of the direction in which the political winds are blowing. Thus, Ford said on Tuesday that it is cancelling plans for a new US $1.6bn plant in Mexico and investing US $700m in its Flat Rock, Michigan, plant’s expansion. It is also worth reiterating that this proposed Republican legislation is in part sponsored by Republican House Speaker Paul Ryan. To extend Chris’s last point, I hear many critics say Trump can’t win by going after companies one at a time. But he doesn’t need to. Making examples of a few high-profile companies already sends a message to others. No CEO wants to be the subject of a Trump tweet. I expect such tweets to slow and eventually stop as corporate leaders refocus their expansion plans on domestic production. This shift will create vulnerabilities in export-heavy economies. For that reason, Chris favors “domestic demand” stories, i.e., countries large enough and wealthy enough to sustain growth within their own borders. That’s a small list, of course. I look forward every year-end to the annual “Mr. X” issue from Bank Credit Analyst. They frame their forecast issue as a conversation with a longtime client. I have no idea whether Mr. X is a real person or mythical, but I feel like he’s an old friend. BCA is also skeptical that the new Washington leadership will deliver much fiscal stimulus this year. They go further and ask the same question about the rest of the world. Mr. X: What about fiscal developments in other countries? BCA: The Japanese government has boosted government spending again, but the IMF estimates that fiscal changes added only 0.3% to GDP in 2016, with an even smaller impact expected for 2017. And a renewed tightening is assumed to occur in 2018 as postponed efforts to rein in the deficit take hold. Of course, a sales tax hike could be delayed yet again if the economy continues to disappoint. 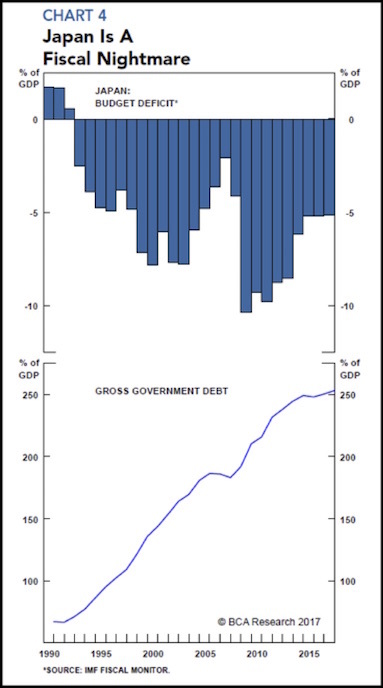 But, with an overall budget deficit of 5% of GDP and gross government debt of more than 250% of GDP, Japan’s room for additional stimulus is limited (Chart 4). Although the Bank of Japan owns around 40% of outstanding government debt, the authorities cannot openly admit that this will be written off. While more fiscal moves are possible in Japan, it is doubtful they would significantly alter the growth picture. The euro-area peripheral countries have moved past the drastic fiscal austerity that was imposed on them a few years ago. Nevertheless, there is not much room for maneuver with regard to adopting an overtly reflationary stance. It is one thing to turn a blind eye to the fiscal constraints of the EU’s Growth and Stability Pact and quite another to move aggressively in the opposite direction. Most of the region’s economies have government debt-to-GDP ratios far above the 60% required under the Maastricht Treaty. In sum, a move to fiscal stimulus is not in the cards for the euro area. The U.K. is set to adopt more reflationary policies following the Brexit vote, but this would at most offset private sector retrenchment. In conclusion, looming shifts in fiscal policy will be positive for global growth in the next couple of years, but are unlikely to be game changers. Their conclusion is classic BCA moderation. I think they may be the unconscious source of my “Muddle Through” philosophy. As much as I would like to forecast either gloom or euphoria, we rarely get too much of either. On trade, BCA sees little risk of a trade war and notes that trade actually ceased to be a net contributor to world growth several years ago: global export volumes have been growing more slowly than GDP. That’s mainly a result of China’s growing domestic production. Inflation and bond yields in the U.S. have passed a cyclical turning point, but this does not mean that a sustained major uptrend is imminent. Let’s start with inflation. A good portion of the rise in the underlying U.S. inflation rate has been due to a rise in housing rental costs, and, more recently, a spike in medical care costs. Neither of these trends should last: changes to the ACA should arrest the rising cost of medical care while increased housing construction will cap the rise in rent inflation. The rental vacancy rate looks to be stabilizing while rent inflation is rolling over. Meanwhile, the inflation rate for core goods has held at a low level and likely will be pushed lower as a result of the dollar’s ascent. Of course, this all assumes that we do not end up with sharply higher import tariffs and a trade war. The main reason to expect a further near-term rise in underlying U.S. inflation is the tightening labor market and resulting firming in wage growth. With the economy likely to grow above a 2% pace in 2017, the labor market should continue to tighten, pushing wage inflation higher. So the core PCE inflation rate has a good chance of hitting the Federal Reserve’s 2% target before the year is out. And bond investors have responded accordingly, with one-year inflation expectations moving to their highest level since mid-2014, when oil prices were above $110 a barrel (Chart 10). Long-run inflation expectations also have spiked since the U.S. election, perhaps reflecting the risk of higher import tariffs and the risks of political interference with the Fed. So again, it’s Muddle Through. Inflation will hit the Fed’s target but not get much higher. As for the stock market, BCA sees reasons for caution but not an imminent crash. They make a good point about wages affecting corporate profit margins. Investors are excited about the prospect that U.S. earnings will benefit from both faster economic growth and a drop in corporate tax rates. We don’t disagree that those trends would be positive, but there is another important issue to consider. One of the defining characteristics of the past several years has been the extraordinary performance of profit margins which have averaged record levels, despite the weak economic recovery (Chart 28). The roots of this rise lay in the fact that businesses rather than employees were able to capture most of the benefits of rising productivity. This showed up in the growing gap between real employee compensation and productivity. As a result, the owners of capital benefited, while the labor share of income – previously a very mean reverting series – dropped to extremely low levels. The causes of this divergence are complex but include the impact of globalization, technology and a more competitive labor market. With the U.S. unemployment back close to full-employment levels, the tide is now turning in favor of labor. The labor share of income is rising, and this trend likely will continue as the economy strengthens. And any moves by the incoming administration to erect barriers to trade and/or immigration would underpin the trend. The implication is that profit margins are more likely to compress than expand in the coming years, suggesting that analysts are far too optimistic about earnings. Long-term growth will be closer to 5% than 12%. The turnaround in the corporate income shares going to labor versus capital represents another important element of our theme of regime changes. As they say, this is potentially a major shift for equity valuations. Companies have sustained profit margins largely due to automation, offshoring, immigration, and surplus labor supply in the US. All those conditions are now changing. That will affect corporate earnings, though the impact will take time to show. Indeed, BCA is bullish on stocks for 2017. The stock market is vulnerable to a near-term setback following recent strong gains, so this is not a great time to increase exposure. However, we do expect prices to be higher in a year’s time, so you could use setbacks as a buying opportunity. Of course, this is with the caveat that long-run returns are likely to be poor from current levels, and we have the worry about a bear market some time in 2018 if recession risks are building. Playing market overshoots can be very profitable, but it is critical to remember that the fundamental foundations are weak and you need to be highly sensitive to signs that conditions are deteriorating. By BCA standards, this is a pretty bold call. “We do expect prices to be higher in a year’s time” may come back to haunt them when Mr. X comes around next December. Or maybe he’ll be grateful they had him hold on. I could actually add another 15 or 20 pages from another dozen forecasts that are worth reading. (Forget the dozens that are either just boring, too dense to understand, or insane.) I selected these for the variety of views they give us (and views that are not necessarily my own). One anecdotal note: I had lunch today with some colleagues, and one of the ladies is a good friend who is a broker/advisor at one of the big wire houses. She’s normally a fairly cautious, value-oriented investor; and she commented on how her client seemed to have changed in the last two months (read: since the election). “They became way more positive and ready to make decisions. They are moving money from the sidelines and taking positions.” That squares with all of the sentiment polls and especially with the latest NFIB (National Federation of Independent Businesses) optimism poll. I am hearing that from all over. That optimism is good for the economy and markets, but it doubles the pressure on Congress and President-elect Trump to actually follow through with legislation, tax cuts, and the cutting of unnecessary bureaucratic regulations, in order to actually provide economic stimulus. I am worried that no matter how much Congress thinks it will deliver – and believe me, if they give us anything they will think it’s a big deal – it won’t be seen as enough. I guess the flip side of that trade is that half the country has extraordinarily low expectations of soon-to-be-president Trump and Congress, so it may not be hard to clear that bar. I’m trying to arrange a series of meetings in Washington DC next week, which I hope to videotape for you, to try to cut through some of the stuff that dreams are made of and try to figure out what might actually come out of the sausage mill. Right now, schedules are very up in the air, so it may be hit or miss as to whom I get to see, but I expect to come back with more information than I have now. Shane and I will be in Washington for the inauguration. We will go straight from DC to the Inside ETFs Conference in Hollywood, Florida, January 22–25. If you are in the industry and coming to that conference, make a point to meet with me. Mauldin Solutions (my investment advisor firm) will have a booth where I will try to hang out some. If you are an independent broker advisor in the area, come by and see me. I will be making some big announcements at the conference. Then I’ll be speaking at a one-afternoon conference hosted by S&P Dow Jones here in Dallas on February 1. I will then be at the Orlando Money Show February 8–11 at the Omni in Orlando. Registration is free. I am also scheduled to speak at a large hedge fund conference in the Cayman Islands February 14 to 18. Details on the Cayman conference to follow. I confess to being a political junkie. I was seriously involved with Republican Party politics in Texas and nationwide for about 20 years, ending in the early 2000s. Business and personal issues dictated that I reduce my involvement; and, surprisingly, I have not missed it. But that didn’t end my fascination with the process. That started in high school and college. (I told George McGovern I would vote for him and I did. I also voted for Jimmy Carter.) But then things changed. Back in the late ’80s, you could get all the Republicans in Texas together in a small hotel and have room left over. We pretty much all knew each other. Not so much today. But I don’t recall ever having the political process captivate my attention as much as it has this last cycle. I think that’s because soon-to-be-president Trump represents the potential for significant change, and not just in things like entitlement programs or taxes or the posture of the Defense Department. There is the potential – and let me emphasize that it is potential, and not something we will know about for at least a few years – that the businessman side of Trump can reorganize how the federal government works. I have observed over the last 20 to 30 years that good – even great – ideas from well-meaning politicians, even if they are passed into law, get lost in bureaucratic political correctness and legalese and die. Whatever emerges from the bureaucracy is not what was intended by the original legislation. And this has become an increasing problem. I am driven, and have been since elementary school, to try to figure out what the future will look like. In a way, I am much more interested in “future history” than actual history as the driver of my thinking and writing. I can imagine a future in which Trump “drains the swamp” of bureaucratic detritus and makes some real, positive change possible. I’ve been reading and listening to Newt Gingrich’s essays on what he calls Trumpism. He is doing a seven-part video series at the Heritage Foundation and has delivered the first two sessions, which you can see here. (You will have to scroll through other videos.) Those interested can sign up for the entire series here: "Understanding Trump and Trumpism." There was also a great essay by John Steele Gordon in this morning’s Wall Street Journal. In fact, there are dozens of people trying to figure out what the heck is going on with the new administration. It is unlike anything we have seen. My associate Patrick Watson, a voracious and omnivorous reader of a wide variety of media (I simply can’t keep up), noticed the following coincidences. Kissinger shows up to meet with Trump, on the same day that Japanese Prime Minister Abe is also in Trump Tower. Two weeks later, at the very moment when Trump is calling the Taiwanese president (upsetting the apple cart in the press), a 93-year-old Kissinger decides to visit China on the same day and happens to be meeting with Chinese Prime Minister Xi Jinping. I don’t know that that has been picked up in the press. Neither has the fact that a short time later Mr. Kissinger comes back to Trump Tower, and now State Department Secretary nominee Rex Tillerson is there on the same day. Other than the coincidences of timing, there is nothing that we know about these interesting events. I had an interview yesterday with Christof Leisinger, business editor of the New Zürich Times (technically Neue Zürcher Zeitung, Wirtschaftsredaktion, for my German readers). He asked me a question that I’ve been asked several times: who do I think will be the next Fed chair? My standard glib answer is, “the usual suspects,” and I’m always adding my favorite, Richard Fisher. But then it occurred to me that that is not the correct answer. The correct answer is, we literally don’t know and have no idea. Trump had 75 people in his pool of potential nominees for the head of Veterans Affairs. I am told he interviewed 25 of them. Who in God’s green earth would ever interview 25 people for one position? One that, frankly, is a little bit down the league tables. Not that it isn’t important, as there are literally scores of important appointments, but 25 interviews? If we look at what Trump is doing so far, it seems to be what he does in business: He looks for the best person he can find, searching and interviewing, and then goes with what his instincts say is the right person to make the vision happen. Of course he interviews the usual suspects, but he also reaches outside the box. That is why we are getting so many new faces and people that, frankly, would have been excluded from a Bush administration as too controversial. I look at each appointment, and what I see is somebody carefully chosen to do a particular thing and to force the bureaucracy to move in a particular direction. So when it comes to picking a Fed chairperson, I expect him to interview Warsh and Taylor and Fisher, but I’ll make a side bet that he interviews a few other people as well. I think it’s only 50-50 that he picks one of the usual suspects. We’ll get some indications of the direction he wants to see the Fed go with the first two nominations for the governor positions, nominations that I assume will happen within the next 60 to 90 days. That will give us a little clarity, but I don’t think his process of interviewing a number of people and listening to them as to what to do before he makes a decision (the opposite of what he does when tweeting) is going to change. When was the last time we had a cabinet room with only one lawyer in it? And that is Attorney General nominee Jeff Sessions, who by the very nature of the office has to be an attorney. None of these new cabinet appointees are walking into the room already having ruled out choices because they conflict with current legalistic thinking. They are thinking “How do we accomplish the job?” After they have figured out what they want to do, they will deal with the lawyers. How many of you know entrepreneurs who see lawyers as something they use in order to get done what they want to do rather than as somebody to tell them what they can’t do? They pay attention to good advice, and they stay within the rules, but doing so is not at the top of their mind when they are trying to figure out how to achieve the objective they have for their business. Can Trump really do that? It certainly seems like he’s going to give it the old college try. If he can really relieve the bureaucratic sclerosis that we have created in government, that, more than anything else, will be a lasting and meaningful change. Anyway, it is a fascinating thing to watch, especially for those of us who are trying to figure out how the markets and the economy will turn out. I am not so certain that world events, at least from an economic standpoint, will allow Trump to deal with pressing economic issues sooner rather than later. The problems of Italy and China are not running on his timetable. I keep hearing Trump say that China is a currency manipulator; but the euro, yen, and pound are all down anywhere from 30–40%; and the yuan is hardly even down 5% from its peak. They are spending huge amounts of their reserves to prop up the yuan, and I am not certain how long they can keep it up. The international desk at the Treasury Department is going to be very busy. It’s time to hit the send button. You have a great week and remember that, in our own little part of the world, we are allowed to try to create our own future rather than simply allowing larger forces, the sturm und drang of the world, to dictate it. We have to pay attention to the world, but we are not bound by it. Have a great week!